Connect with Anyone in 90 Seconds or Less! ​Part 1. The Mindset - have unstoppable confidence, be charismatic, and have magnetism. Learn: Empowering mindset and attitude techniques. Reframing techniques that help you instantly become more engaging, relaxed, confident, and poised. Three dangerous words to avoid. Words that impact your confidence and energy. Energy techniques that help create and project confidence and charm. What to look for before you approach someone so you are prepared to instantly create rapport. How to prepare for a successful interaction. Part 2. The Contact - what to do (and not do) in the first vital 2 to 7 seconds of initial contact to create instant rapport and be charismatic...instantly create a natural sense of connection and understanding. 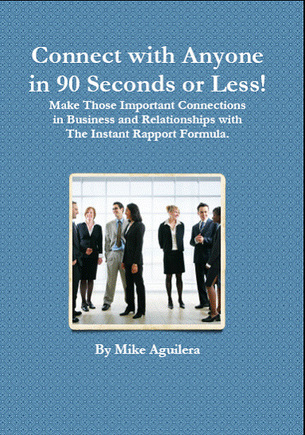 Discover: What you absolutely have to do in the initial 90 seconds to instantly create rapport with anyone anywhere. How to approach someone so they instantly feel a sense of connection and trust. How to stand and sit with people so they like you and believe your message. Body motion to avoid...motion that will break rapport and create distrust. How to remember someone's name and secret about saying someone's name that creates instant connection. Part 3. The Conversation - what to notice, body motion, voice patterns of influence, and questions to ask so you naturally and easily develop rapport. Discover: Five of the most powerful questions to ask to discover a person's communication style (and your own). Know which questions to ask to understand what motivates a person and how they make decisions. Nine dangerous words to avoid. Words that create a negative train of thought and will break rapport. Three powerful persuasive rapport building words to use. Which body motion to use and which to avoid. How to read people so you can maintain and enhance your rapport. Discover how to identify a visual, auditory or kinesthetic communication style and how to utilize during a conversation. This understanding will help you create a powerful connection. How to know when you are in strong rapport. Part 4. The Follow Up - how to maintain rapport, trust, and confidence. Discover: How to follow up. What to do to maintain a positive rapport relationship so they see you and acknowledge you as an expert and leader...not just a nice person. What to do via email to maintain and create rapport. What to do over the phone.